Mahindra Alturas G4 is available in India from INR 26.95 lakh, challenging the likes of Ford Endeavour and Toyota Fortuner in its segment. The car measures 4850mm in length, 1960mm in width and 1845mm in height. The wheelbase is even class-leading at 2865mm. The base variant is available with 4x2 drive-train while top-spec Alturas G4 offers 4x4 and additional features for INR 29.95 lakh. The shade options are also very impressive for the Alturas G4. Ford Endeavour, on the other hand, is available in a 4x2 variant duo for the 2.2L engine. The trend variant rivals G4 4x2 while Titanium targets the audience of G4 4x4. 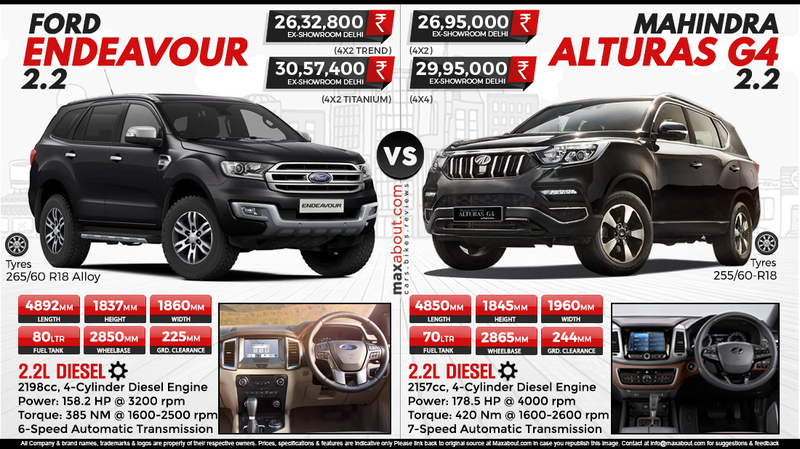 However, the pricing for Mahindra Alturas went slightly wrong as buyers were expecting INR 2-4 lakh of difference between both these cars. Priced with a gap of less than INR 3 lakh from the top-spec Alturas, the 3.2L Endeavour is another great choice in this segment.